Display and store your wines properly and conveniently. Our racks show off your attractive and colorful wine labels beautifully. Bottles lie horizontally which keeps the corks wet. This positioning prevents air from getting into the bottles and turning your wine into vinegar. It's poor form to serve wine that has turned to vinegar! Our racks last a lifetime. Unlike cheaper competitors, ours are made from sustainable plantation-grown Radiata Pine in Australia. A very hard wood. Saves you money – purchase only what you need now and then add more rack layers as your wine collection grows. Easy to assemble – NO tools required. You can put your kid to work! Available in a natural or stained finish. Our racks will fit in perfectly with your room décor. Order your Modularack now! All you have to lose is the time you now waste searching around the house for that special bottle of wine. Cheers! How High do you want your rack? How Wide do you want your rack? FREE FREIGHT in the Continental USA! All the Basic Sets are shown. The racks are available in 9 different widths which will fit all rooms of different sizes. You can choose the finish, height, and width, and the website shows you all your options. We will custom design your wine cellar at no charge. Please send us the dimensions of your available space, and we will give you an actual diagram of the racks you will need to fit your room. 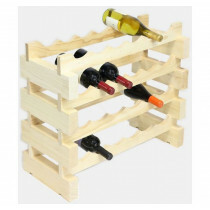 TABLE TOP Option is a great addition to making your wine rack into a table also! !